Our beautiful luxury hand-crafted 5/8 inch 3/4 inch and 1 inch wide latigo leather dog collar are lined with supple deer hide. These deer tan collars are available in 2 colors, Havana brown leather with tan deer hide lining or black leather with gray deer hide lining. 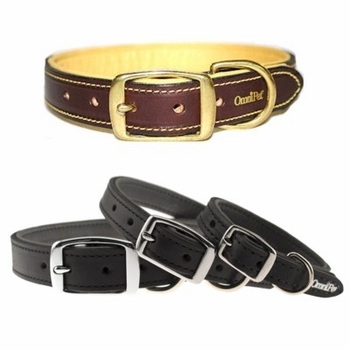 The Havana brown collar has brass hardware and the black latigo has nickel hardware. This collar is measured from tip to tip. For example a size 17 collar is 17 inches long including the buckle to the tip end of the collar. The #4751 is 5/8 inch wide and comes in lengths 13, 15 and 17 for $15.99. The #4752 is 3/4 inch wide and comes in lengths 19, 21 and 23 for $17.99. The #4754 is 1 inch wide and comes in lengths 23, 25, 27 for $20.99 and size 29 for $22.99. To get correct collar size for this collar please measure your dog's neck and add 3 to 4 inches. Please measure your dogs neck before ordering and add the extra inches that are recommended.